Don’t worry, as these floors need less of maintenance and you will not have to worry at all about keeping it shiny all through. 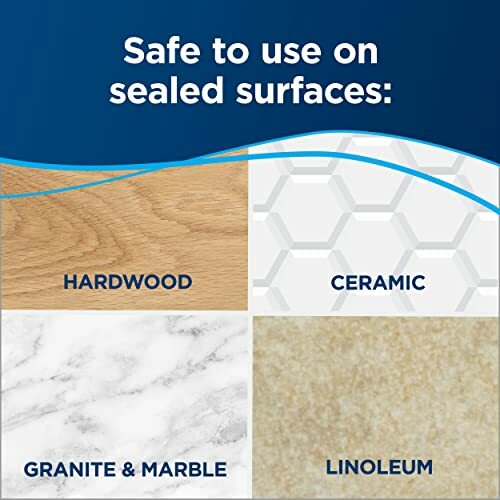 Yes, you may have to be careful of not overdoing things, as you need to remember that you are dealing with laminate here. We request you to pay attention to this discussion and read this post till the end for the same. 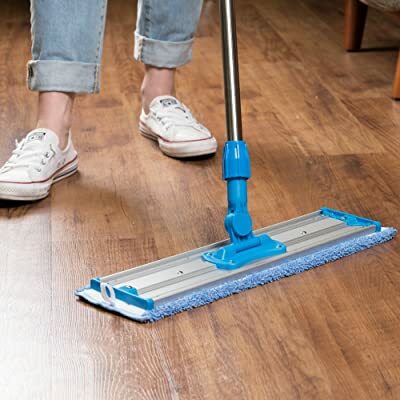 How To Use A Mop On A Laminate Floor? Okay, you may be thinking what is there to think about buying the Best Mop for Laminate Floors? It could sound funny to some because all your life you may have to not even given it a second thought. Budget – Yes, you must decide on a budget for cleaning your laminate floors. The mop should be affordable, as you will be using it daily. You must seek a practical solution for your cleaning purposes. Type of mops – You must avoid steam mops by all means for a laminate floor. 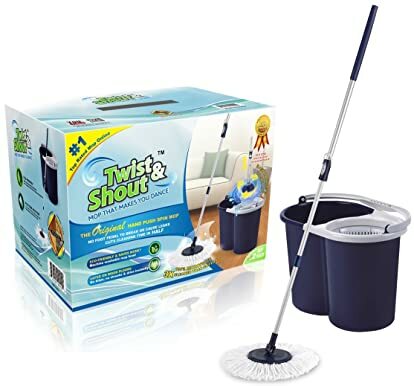 You could give it dry mops a try, spin mops could also be of great use and spray mops with microfiber could be the perfect solution. 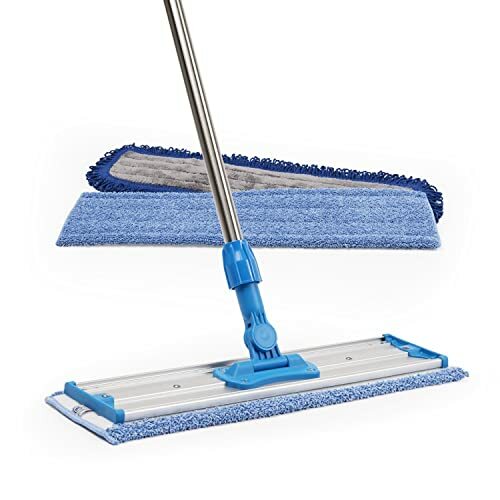 Light in weight – Must be lightweight, as you know this will make moving around easy with your mop. Portability is a big concern for any cleaning product and your mop should be the most flexible of all. Microfiber cloth – Microfiber heads are bang on your buck because you can use them again and again. They pick up dirt, grime, pet hair and fine particles very well. Additionally, these cloths provide a gentle scrubbing to the floor that the disposables lack. 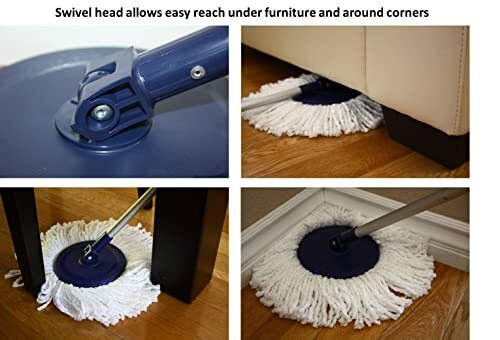 Mop head – A wide mop head will allow you to clean a larger space and a narrow one will offer you with more maneuverability. So, point is to choose wisely but go for a mop that has a swivel head. Vacuuming and sweeping your floor will keep it clean, but you will ultimately have to resort to mopping. This process will add shine to your laminate and also keep it in good condition for years to come. Selecting the right cleaning products will make sure that the top film remains safe. Below are a few more suggestions that will tell you why mops are good for laminate floors in general. The first thing that you need to do as part of preparing yourself for mopping your laminate is to sweep the area in advance. That is correct, as sweeping the floor before mopping will ensure that there are no bleak particles left on the surface which may scratch your floor further. Remove obstructions – Like furniture, shoes or rugs and then mop the floor. Do as instructed – Read the instructions of the cleaning agent and then concoct the right composition. Use cleaning agent – Mix a cleaning agent of your choice with water that is especially designed for your floor type. Submerge the mop – Dip the mop and wring it before you hit the floor. Get ready – Lift the mop, let it drip and then give it a gentle squeeze. 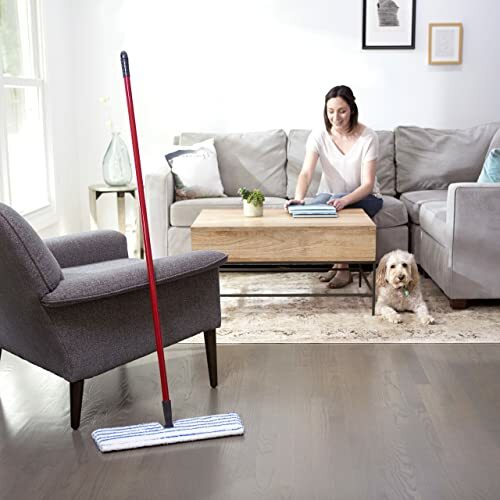 Start mopping – Then start mopping the floor in sections. We have compiled a list of the Best Mop For Laminate Floors that you can read through to get a fair idea of things. If you like chemical free cleaning, then consider gifting you with this one. 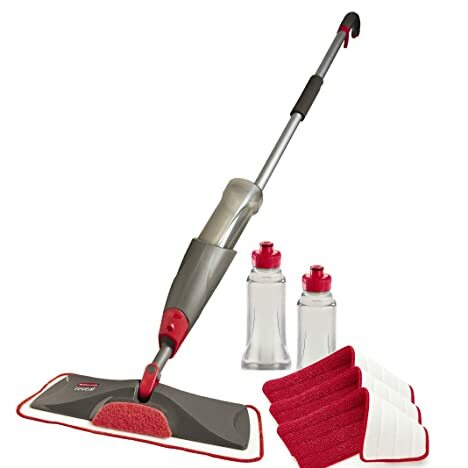 The microfiber technology makes it efficient and the scrub head makes it easy for you to scrape the dirt off the floor. It is an all surface mop that can clean like a beast by collecting debris in an effective way. Very handy for pet owners and rest assured you must be made aware that you may get addicted to its cleaning abilities. That is very true, but if you are convinced yet, then reading about the properties of this mop will certainly get you attracted to it without a doubt. So, keep reading if that interests you. Rubbermaid is a brand that has been catering to the cleaning industry for over 80 years now. The Newell Rubbermaid Inc. makes sure that you get the best from their manufacturing and nothing less. This is why they have designed this innovative Reveal Mop which is safe for all types of floors including laminate floors. 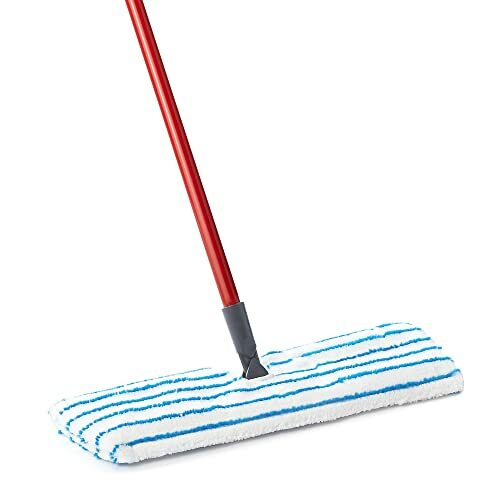 You can sweep, scrub and spray with this mop as per your requirement and continue with your cleaning. We have a product that can transform your cleaning routine at an instant. This an award winning mop that comes with a host of features people would die for. You get a lifetime warranty with this product that shows how genuine it is. Additionally, the testimonials speak for it, but in case you are still not sure about this one, then we are here to help you with that. Before we go ahead with our discussion, we would like to inform you that you could get a lot of videos online to know more about this mop. Yes, the demo videos will educate you all about this mop in a positive way. We are aware of informing you that you should avoid steam mops for cleaning your laminate floors. 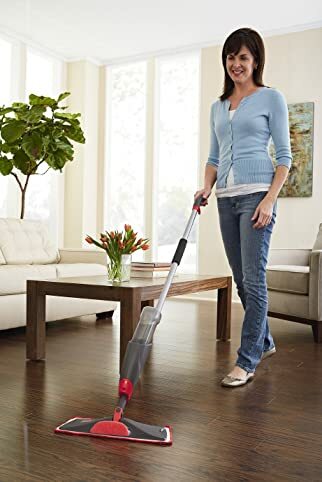 Still we bring you the BISSELL 1940 PowerFresh Steam Mop which you may think kind of goes much against what we are preaching here. However, this is not the case because technically you can use steam mops for laminate floors only with care. You must run a check on the side of the floor to see how your laminate responds to steam. If it discolors or curls, then you must stop at once, otherwise, it is our choice and risk to use steam mops for cleaning laminate floors. 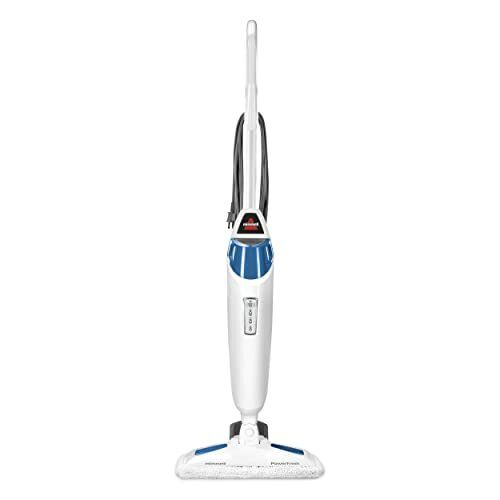 The BISSELL 1940 works twice as fast as other steam mops. There are a few more pointers that may help you understand your laminate floor. You may have found the Best Mop For Laminate Floors, but this conversation will enlighten you about how to take care of your laminate in the best possible ways. Check out the following floor mops too!